Fantastic vacation rental house located at Solara Resort in Orlando, Florida. Great location close to Disney parks, in a gated community and with excellent amenities. The house has large spaces, the architectural design of great quality offers modern and luxurious finishes. Enjoy the open floor style with fully equipped kitchen, modern appliances, breakfast bar with space for 5 people and a formal dining room with capacity for 10. The house has a table for games in the annexed area to the large living room. 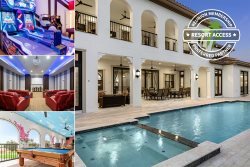 Enjoy gathering the family around the friendly pool, air hockey, and foosball competitions. As for accommodation, the house has spacious rooms fully furnished. a total of 9 rooms, with four king size beds, three rooms with twin beds and a bunk bed. Completing it all, the house has a private pool perfectly covered for more comfort and with an 8 seat dining table under a covered lanai.